I was fortunate enough to find an XL T-Shirt at salvation army that had a glittery card on it. Even better, it was the Queen of Hearts. I suggest an XL because you don't want it to be form fitting, as you can see in the picture above that the dress should not be figure conforming. 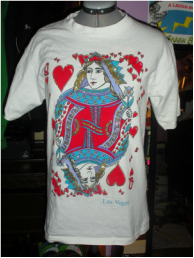 If you can't find a shirt with a card on it, you can always stencil one on. Follow the my steps for How-To Stencil a T-Shirt and paint your own card on the shirt then add some glitter. 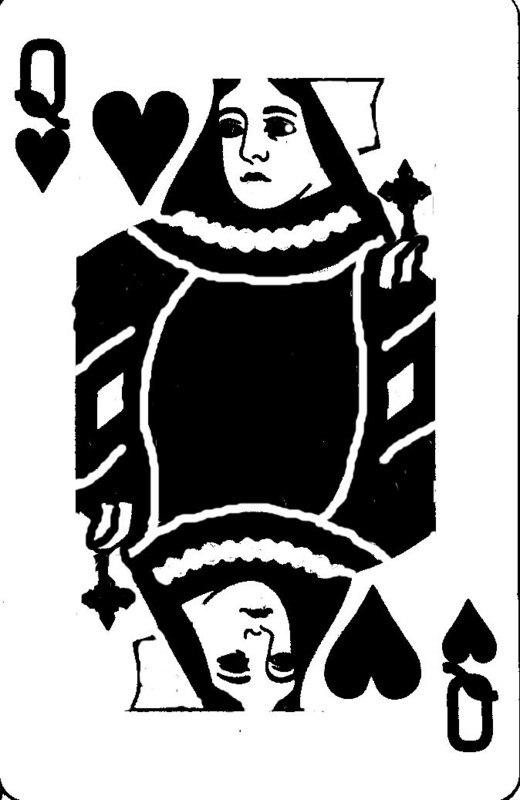 I've made a Queen of Hearts stencil for you here. I will put a how-to up in the coming weeks so you can learn how to make your own stencils as well. Cut off the hem at the bottom of the T, then cut off the sleeves. As you can see i curved sleeves a little bit and cut them down farther on the sides then the normal sleeves. You could leave more excess on either sides to create a capped sleeve look opposed to the tank top look that I went with. Cut the neck like at a scoop as well. Grab your second T in red (you could really use any color you want, I just think the red looked nice and made it into my own version of the card dress). Decide how much longer you want the dress to be and cut a tube off the bottom of the second T-shirt. Stitch the tube to the bottom of the dress! This step can be ommitted if the T-Shirt hung to a length you where happy with! Grab a pair of opaque black tights, little white gloves and cut your hair then even Russell Brandt wont deny you!